When you have a girls’ college in your neighbourhood, along with several eating out options, you are also bound to have budget clothing and accessories available in and around. Keeping true to tradition, the area around Jyoti Nivas College (aka JNC) has a shopping culture of its own. Frequented by a stream of college students on a daily basis, the streets of JNC are alive and bustling with energy, plus offer some great options for retail therapy for the stylista on a budget. So, here are our picks on where you can shop for everything from clothes to gadgets and shoes to makeup. And all without breaking the bank. Almost hidden away in one of the by-lanes near JNC, Scintilla Bangalore boasts of stocking 2,000 one-of-a-kind kurtis on any given day (students of colleges nearby with a really strict kurti dress code — are you listening?). They specialise in cotton kurtas and budget ones at that. Apart from pretty kurtas, these guys also stock palazzos, printed leggings and Jaipur-inspired waistcoats. And you know what the best part is? There’s an in-house tailor who does fittings too, on the spot. Besides that, their sizes go from Small to Extra and Extra Large. Look out for the friendly owner, Sangeetha Shrikanth, who will assist you through your shopping experience here. Technically, the store isn't on JNC Road, but is within 500 meters of it, so it definitely belongs on this list! As the name suggests, Uniquera has, well, unique pieces for all you trailblazers (on a budget). Their philosophy 'life is too short for boring clothes' reflects in their curated collection consisting of eclectic women's (and men's) wear whether you want to dress up or down. They've got clothing, footwear, bags and, accessories - some basic, and some distinctive pieces that you can add to your wardrobe to mix and match your outfits. We know this ain’t the first time you’re hearing about them. Spice Girls is probably the hottest spot to get yourselves kicks in Koramangala. 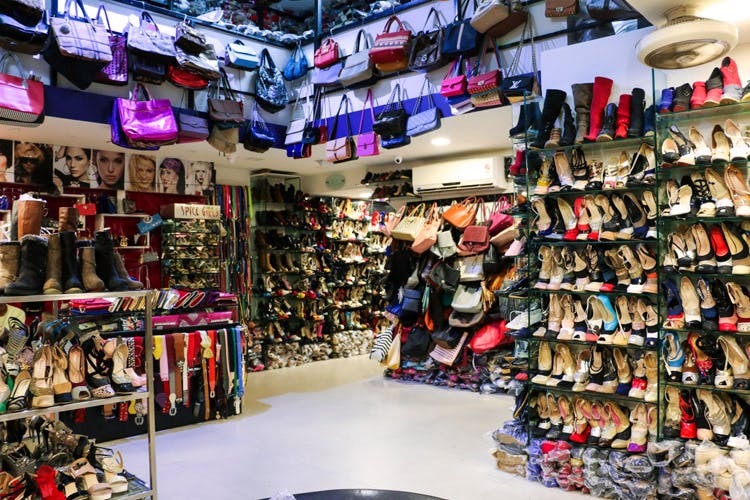 This immensely popular store offers a range of trendy shoes and bags that will have you drooling. They follow global trends and you can get shoes and bags for prices that won’t sink your bank account either. Whether it’s stilettos, boots, sneakers, ballerina flats or sandals — they have got it all, and so many kinds to choose from. Our recommendations: their endless collection of stylish boots and stilettos. Take your pick here from statement necklaces in styles such as layered, junk, pendants and chokers. Their earrings are eye-catching as well. Our favourite is the supremely affordable (INR 30 only) stylish finger rings. They also do sling bags and boots, but we’d recommend you hop over to Spice Girls for that instead. A hole in the wall almost, Two Monks is great for casual clothing for men and women. Mostly selling the evergreen tees, jeans and shorts, they have a larger collection than do for women, the store stocks clothes from some big brands at very reasonable prices. They're all about the basics, so you'll spot some comfy flannels and boxers with funky prints. Ladies can check out their casual tops, dresses, jeans and shorts in cute colours and prints. You can read more about them here. For all you whimsical souls looking for good vibes only, Psybaba's second outlet will tickle you pink! Much like their first store, you'll find all colours of the rainbow in all its shades and hues, and great as music festival OOTDs. Heavy on the Bohemian vibe, the outlet stocks clothes, accessories (definitely worth buying if you're looking for some quirky statement pieces), footwear, and a limited number of home decor (we spotted glow paint, if that's your aesthetic). The apparels and accessories available in Raheja Arcade are absolute steals. While all of their products cannot be highly recommended, they have some ethnic and indie wear that are affordable and fashionable (like the tie-and-dye styles). They also have earthy jute wallets and few costume jewellery pieces that are worth a dekko. Look out for this store during the sale season. InMark offers plenty of budget options for women and children. You can find lots of variations within casual, formal, party and ethnic wear for women. The accessories are great as well. Kids’ collections have adorable dresses and skirts that you would want to grab for your little munchkin. If you are looking for some great options as far as lingerie is concerned, look no further than Tibet Mall. Here you will find pretty bralettes, which can be worn under muscle tees or can even work as a slinky blouse for your sarees. Crop tops, high waisted pants, dungarees, and really cool makeup kits (like vanity cases) are all up for grabs here. Looking for makeup that doesn’t cost the earth? Tibet Mall will come to your rescue with many of its tiny stores offering mascara, lipsticks, fake eyelashes, blushes, and more. And for any kind of studs you might be looking for: from nose pins to studs for the ears, belly buttons and more, your search will end here. Conveniently located right at the entrance of JNC, the store displays the "Jazziest" pieces up against the tree in front of the entrance, so you have no trouble spotting it. Updated with the latest trends of the season, you'll find everything from shrugs to dresses and crop tops in funky (or jazzy) prints here. They stock their clothes in all sizes and will also alter clothes if needed. If you're rather particular about your style, prepare to spend a tad longer sifting through their extensive collection to find that perfect addition to your outfit.